RISE VELO + throwing program is a newly launched 12 week throwing program to improve a players velocity and arm health. RISE has tested and studied various training programs over the past few years and has designed a comprehensive program to help develop arm health, better mechanics and velocity for all players. VELO + is not designed for just pitchers, but for all players who are looking to increase arm health and velocity all across the diamond. The VELO + program focuses on the proper use of the players kinetic chain to help produce the max velocity in the players body. VELO+ will use a variety of different drills to create new movement patterns so players can understand how to use ground force (velocity and force is produced from the ground up) correctly and how it transfers up the kinetic chain into the ball. 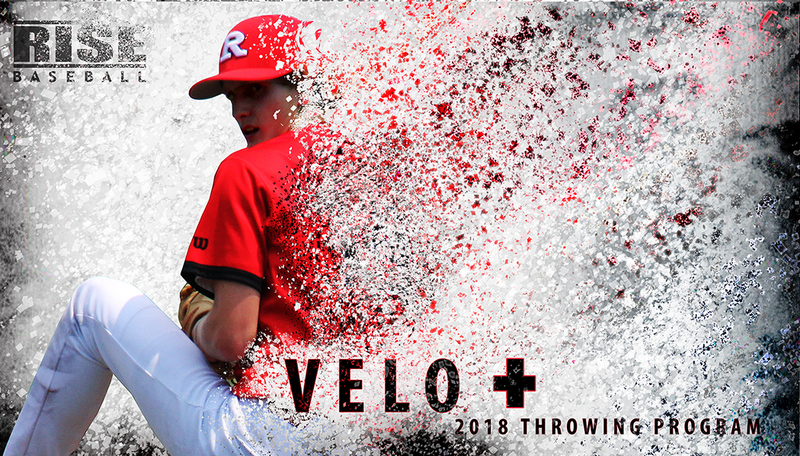 In addition to gaining velocity the VELO+ program will educate players on how to recover quicker through a post-game routine, and weekly routine to keep the arm healthy and strong through an entire year. One of the most valuable parts of VELO+ is the extended training that allows players to start off slow with a strong foundation and build into the kinetic chain. The first 4 weeks players will focus on how to use the kinetic chain and get the arm and body back into throwing shape. The next 6 weeks will show players how to get to the On-Ramping stage and push the body to the next level to gain the velocity desired. The last 2 weeks is a maintaining stage, thus getting the body and arm in shape for the upcoming season.